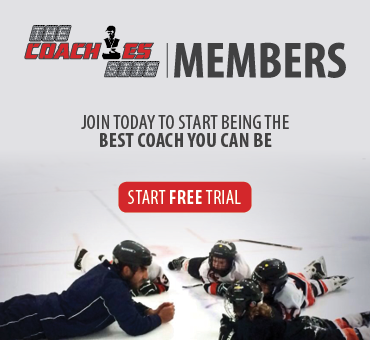 Scoring goals and preventing goals is the driving force behind every drill created in hockey. Defensive structure, neutral zone play and offensive flow dominate practice rinks across Ontario. Teams that produce and prevent high quality shots win more games. With hockey continually transitioning deeper into analytics, a blueprint has begun to emerge on how to create more efficient opportunities. Recent studies of the neutral zone and teams creating offensive and limiting defensive zone entries with speed has shown an increased ability to control the possession game. The desire to isolate these high ends opportunities was one of the driving forces behind my work on the Shot Quality Project at Sportsnet.ca. Shooting and save percentage count all shots on goal equally. In order to differentiate between these opportunities I focused my attention on more accurate location than the current data as well as pre-shot movement. I discovered that while only 15% of all NHL shots I reviewed involved pre-shot movement, it accounted for 50% of all goals scored. Former New York Rangers goaltender and current TV Hockey Analyst for the Rangers and msg.com, Stephen Valiquette (also an OMHA grad) has taken his exhaustive study (he reviewed 100 games during the 2014/15 NHL season) in a new direction with the introduction of the Royal Road. When I saw Valiquette’s research, I realized that he provided a new dimension to my previous study and created another layer to the shot quality debate. Valiquette has identified what he believes is the most important line on the ice, the line he believes supports the existence of shot quality. The Royal Road is a line that goes directly through the middle of the ice from one net to the other. It separates the ice into two equal parts. 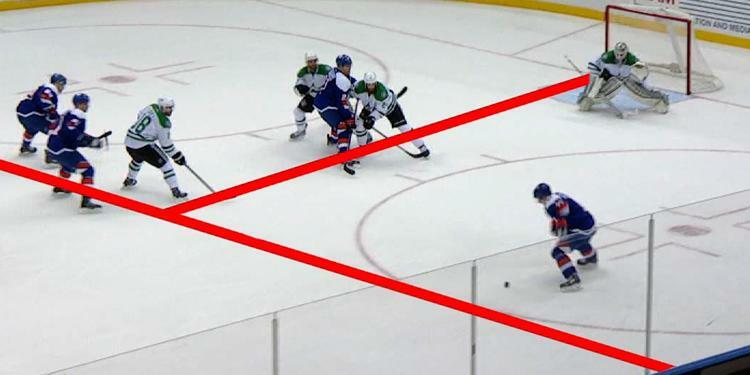 Valiquette has observed that a puck crossing this imaginary line immediately preceding a shot increases a shooter's scoring opportunity by over 10 times. When the puck crosses the Royal Road, it changes everything because goalies have limitations to their movements and while laterally tracking they are forced to open up. While reviewing all of this NHL footage, a pattern of success began to emerge. These high percentage opportunities were labeled Green goals because they do not allow the goaltender to gain half a second of clear sight prior to the release. Green goals account for 76% of all goals reviewed. Green goals are plays where the goaltender has limited time to set depth and angle and has less than half a second to track the incoming shot. These shots are high percentage opportunities and fit into seven different criteria. The most effective way to create offence in the NHL is a pass across the Royal Road. This is judged as any pass that goes across that line below the tops of the circles that results in a shot on goal. It accounts for 22% of all goals that Valiquette has reviewed. My shot quality research confirms this study as players shoot 30% on average on a pass across the Royal Road vs. the typical 8.5%. This type of movement is essential to goal creation because when the puck moves laterally with speed in this manner, it doesn’t allow the goaltender to remain square because they struggle to set their depth and angle, making the save more difficult. As the position has evolved, goaltending has become so strong that teams need to crowd the front of the net and layer it with players to obstruct a goaltenders view. If a goaltender cannot view the puck it decreases his chance for success because he cannot set for the play and relies solely on positioning and luck to succeed. When players effectively layer in front of the goaltender their chance for success increases. 10% of all goals are scored in this manner. These are plays that generally originate from behind the net and are quick passing plays to a shooter in the slot on the same side of the Royal Road. It is tough for a goalie to pick up because he has half a second of clear sight and set up time before the release from the shooter. It isn’t as valuable as the pass across the Royal Road because the goaltender doesn’t have to move east-west and the distance traveled to get into position is much less, but extremely dangerous because of the quickness of the direction change. Broken plays can cause havoc for goaltenders because they set for a situation that can be altered by a quick change in puck direction. Passes or shots that deflect off a skate/stick into the net. Puck direction that when altered act like a Royal Road pass as it forces a goaltender to move east/west while in recovery mode. Note: The Royal Road was discussed in a previous edition of Video Coach. If a player enters the offensive zone with speed, a defense happily exposes the exterior and attempts to clog the middle. They do this with good reason. They are attempting to deny the attacking forward the ability to cross the Royal Road. Studies show exterior shots have a low probability for success and Valiquette’s study identifies a shot from above the face-off circles and no lateral movement will results in around a 3% chance to score. If the attacking forward is able to cross the Royal Road through the slot, his chances increase to 33%. Deflections are extremely challenging because they initially presents themselves as a red shot. 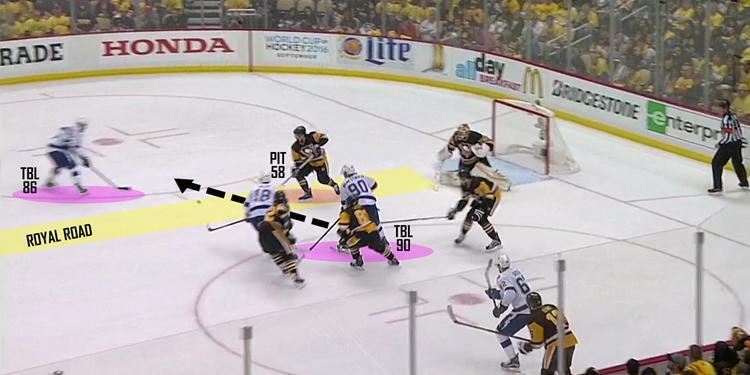 A goaltender sets for the initial path and plane but when they are altered, the maximum coverage becomes compromised. The closer the deflection to the net, the lower chance for goaltender success. A green rebound is any scoring opportunity that comes off a goaltender that originated from the green shots listed above. These high end opportunities are difficult to control for goaltenders because pre-shot movement or lack of visual attachment make it difficult for goaltenders to have proper hand position to deflect pucks into safety areas as well as set for shots so they can corral them into their chest for a stoppage in play. Green opportunities account for over three quarters of all goals scored in this study, yet they only account for one quarter of all shots taken during a typical NHL game. To put that in perspective, during an average 30 shot NHL game a team will take 22-23 Red shots. Red Shots are low percentage shots on net where Goaltender has more than a half a second to see the shot. Goaltenders have an extremely high success rate with these opportunities because without lateral movement across the Royal Road or significant pre-shot movement they are able to set angle, depth and create strong visual attachment to the puck. At this point the shooter is relying on either a perfect shot or goaltender incompetence for success. Only 18% of goals were scored in this situation. Red Rebounds are possible entirely because of goaltender failure. They differ from green rebounds because of the nature of the initial shot. When a goaltender fails to control an easier opportunity he creates a red rebound. All rebound opportunities have a higher probability of success, rebounds of controllable shots are self-inflicted by the goaltender, so as a shooter it isn’t the best plan to rely on this incompetence. When combining the two research projects it becomes apparent that shot quality exists. It’s real. The more accurately we quantify it, the better accuracy can lead us to better ways to evaluate players and improve coaching techniques. By implementing these observations to create game plans and practice drills we can not only create, but prevent these types of opportunities. Chris Boyle is a freelance writer who's work has been featured on Sportsnet and MSG. He is also a goaltender coach, scout and consultant.